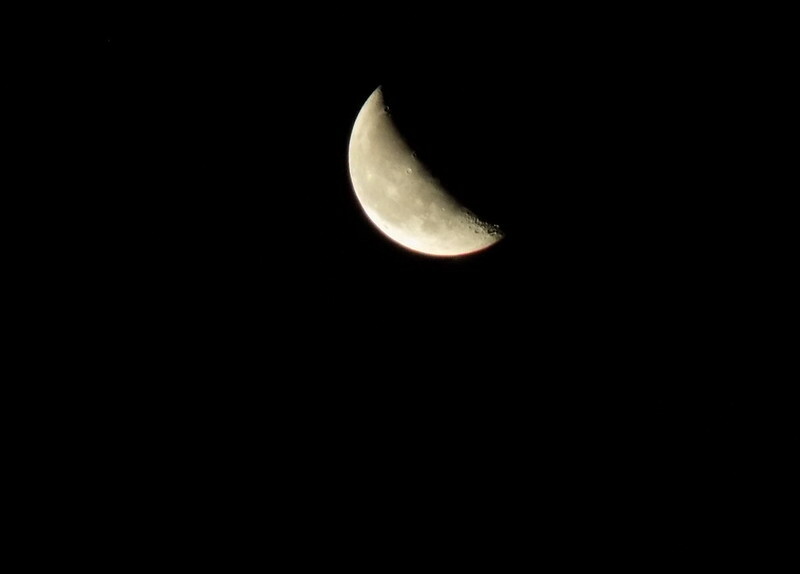 Not quite a banana shape but that's what the moon reminded me of. 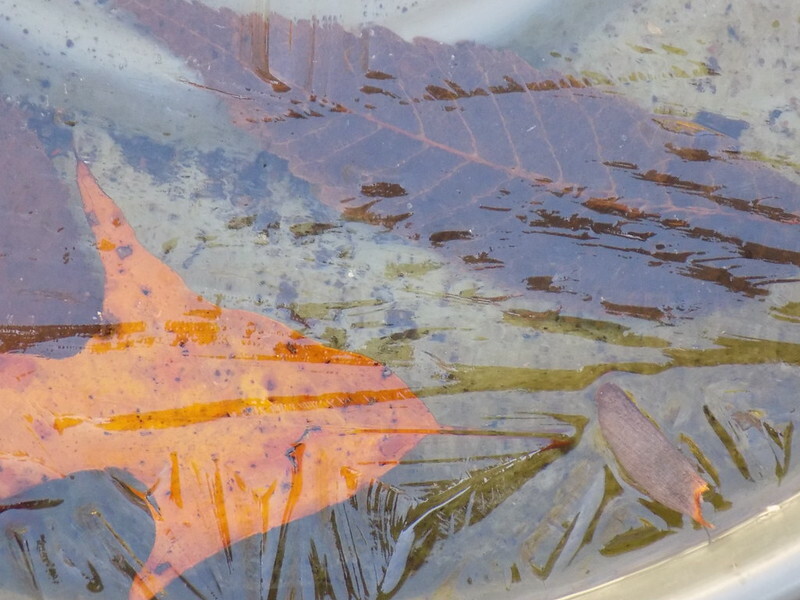 Beginning to have some ice to clear out of the bird baths. 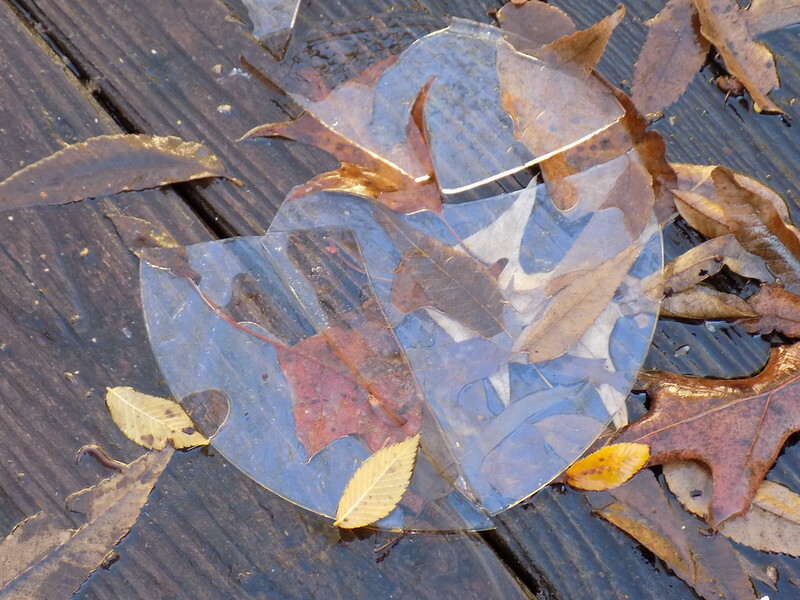 Before I dumped the bird bath ice and leaves out, it look like saran wrap. 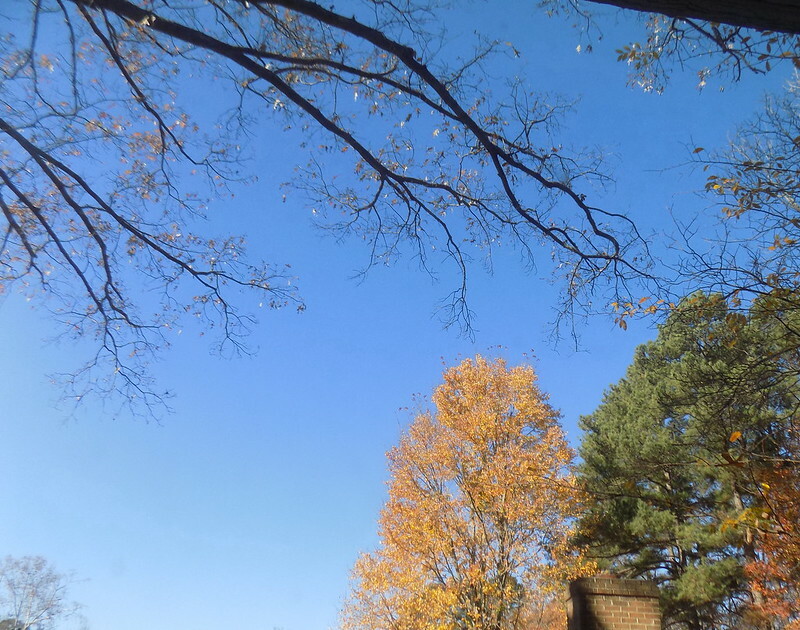 The leaves have fallen from almost all the trees but this one in my neighbor's yard is always the last to change and let go. 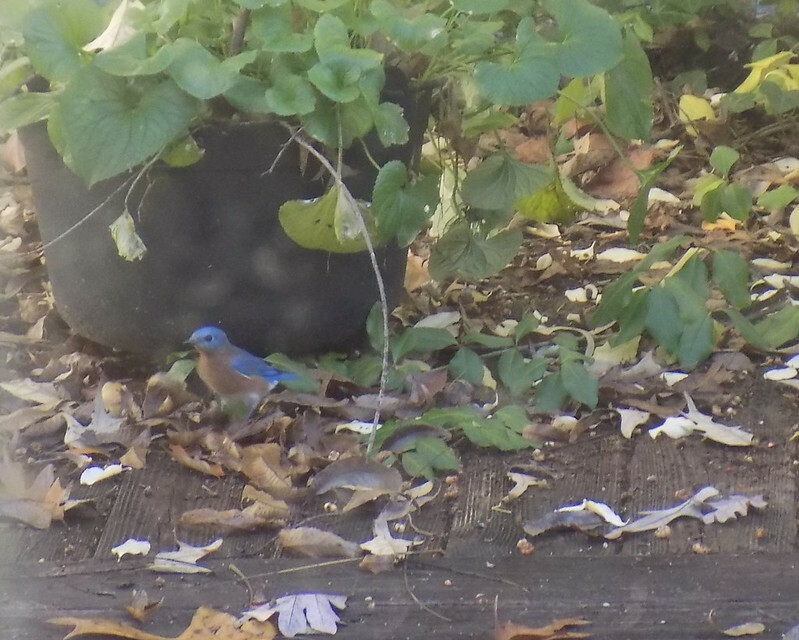 I need to clean the panes on my door but the bluebird is a beauty in spite of the surrounding smudges. 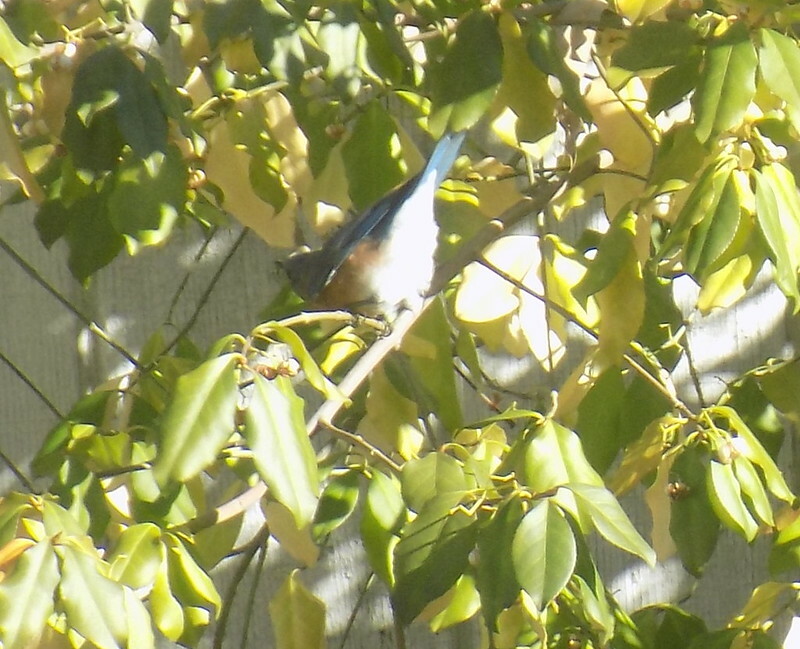 He or she is foraging in the bittersweet vines. 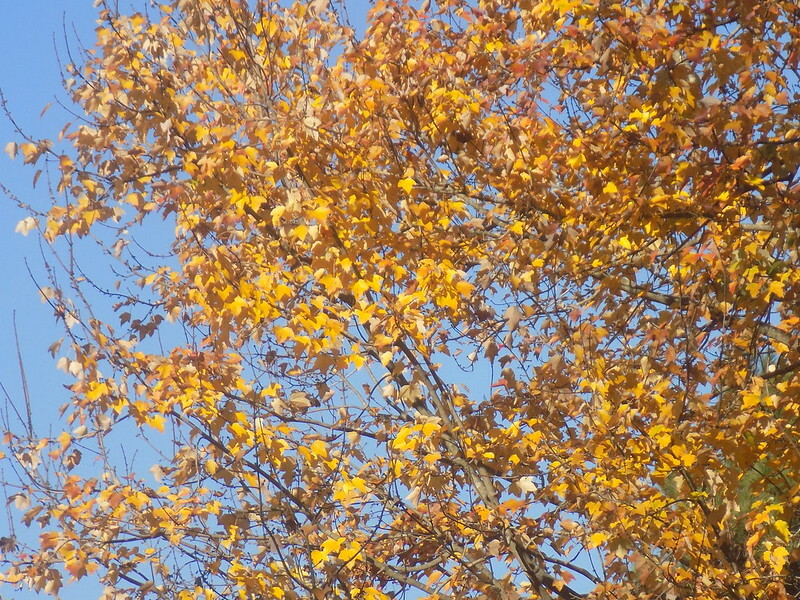 Another shot of the last tree with colorful leaves. 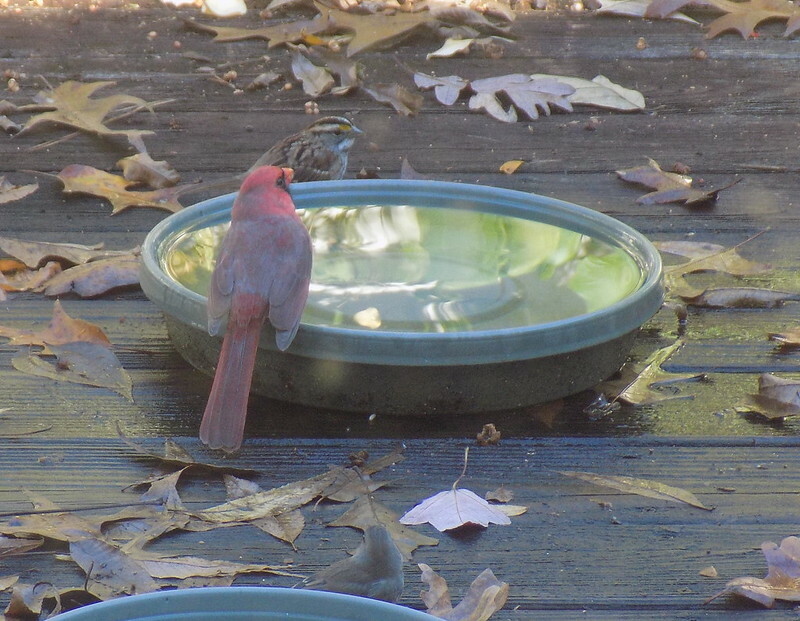 Below the cardinal and sparrow are facing each other across the bird bath and at the bottom of the shot is a blurry junco. 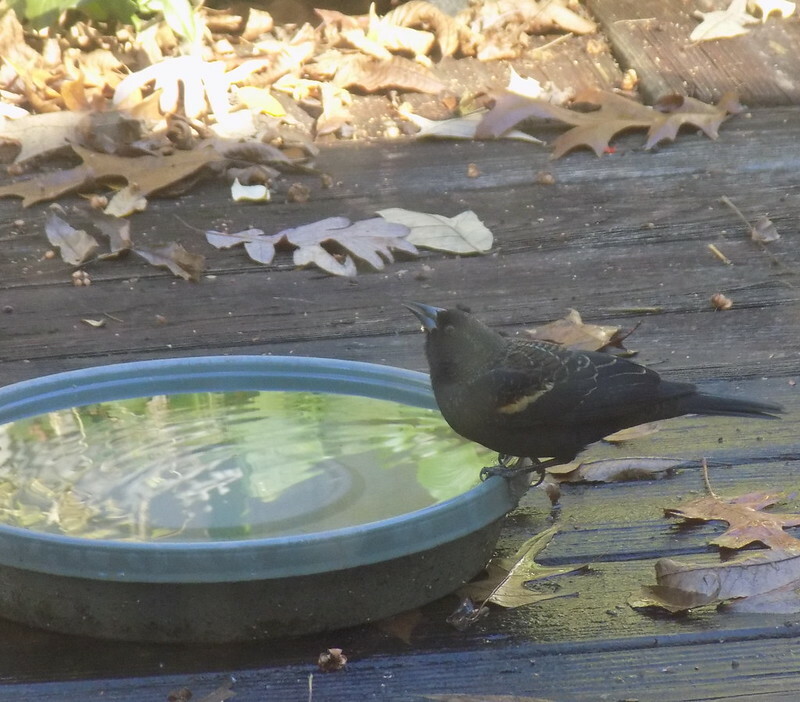 I think the bird below is a starling. 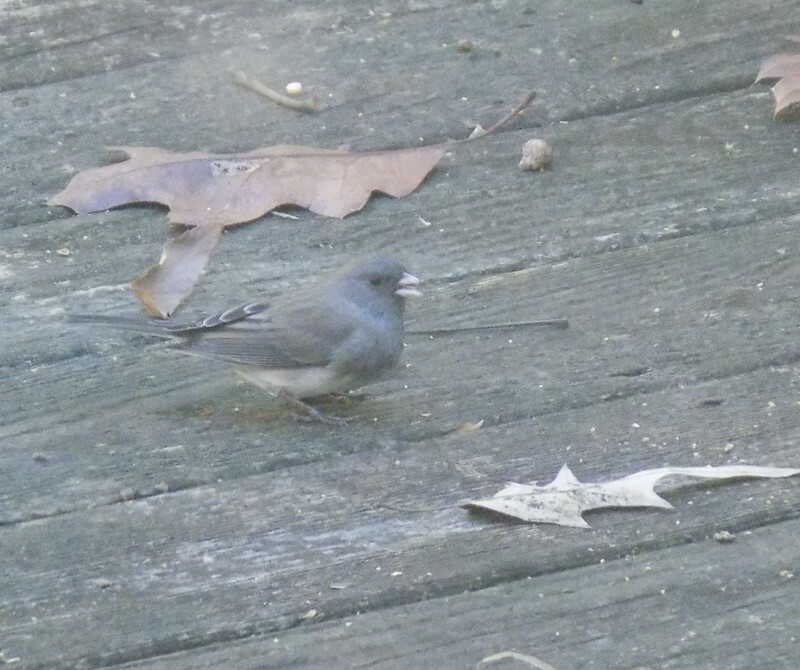 I usually don't see juncos except in the fall and winter. 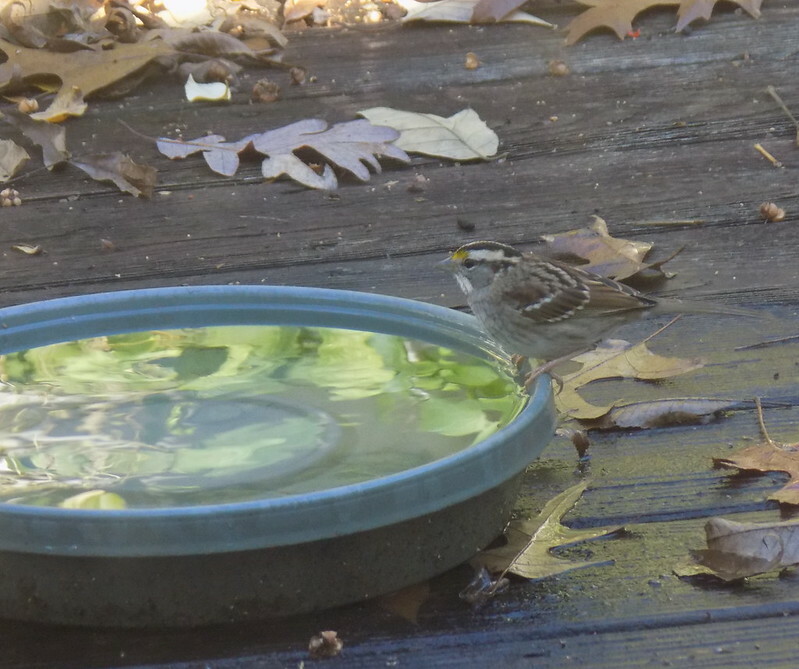 I like the reflections in the bird's water saucer the sparrow is perched on. 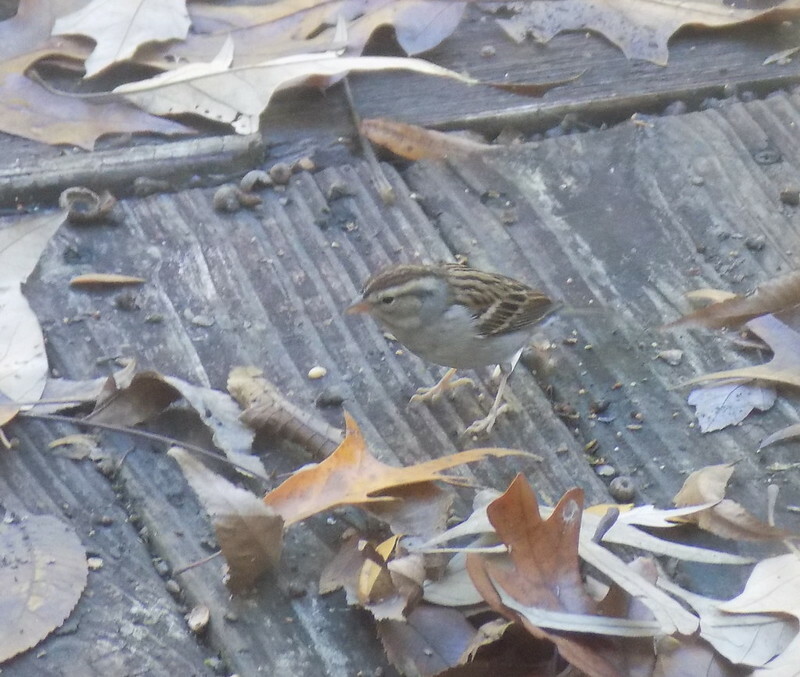 The sparrows and juncos tend to blend into the deck. 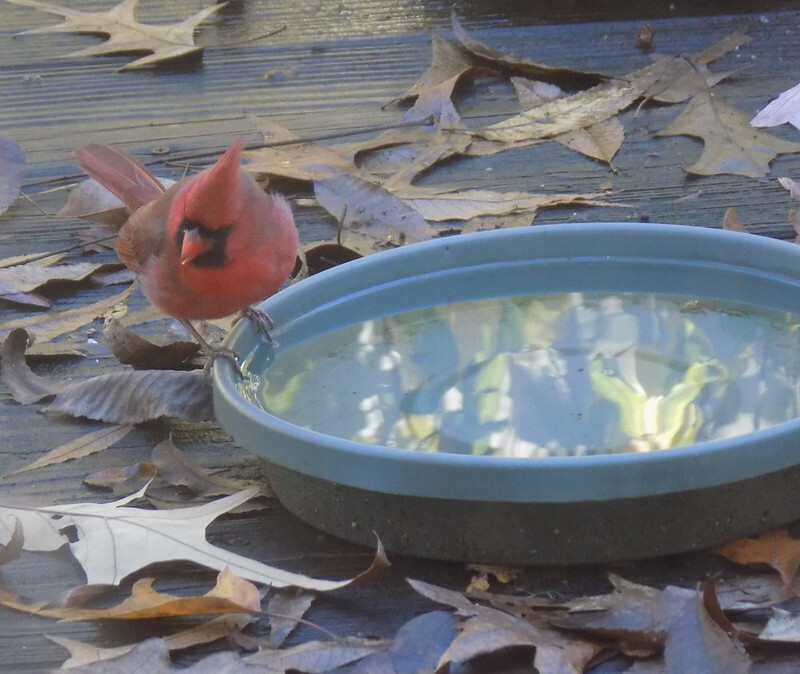 The male cardinal was turning his nose (beak) up at me. The reflections make it look like there's a lot of green but that's just from the bittersweet vine leaves that haven't all dropped off yet. 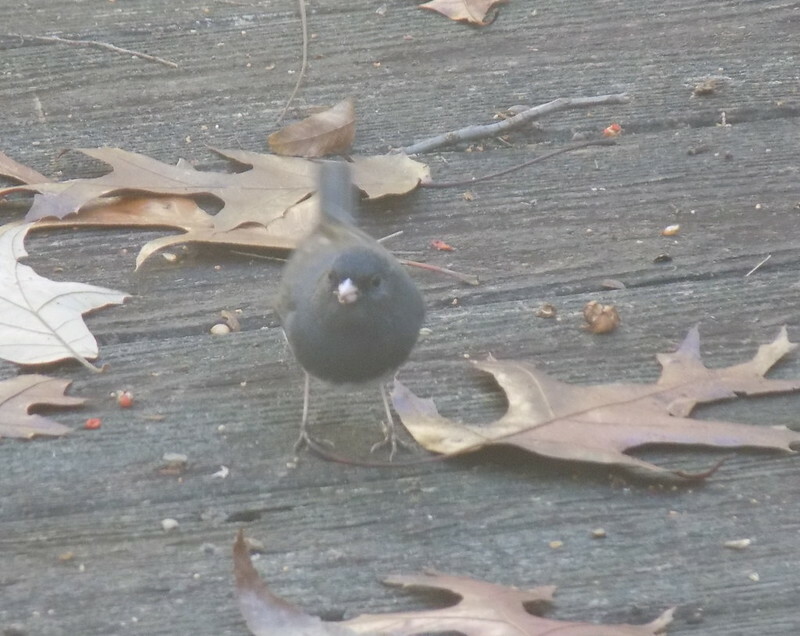 I think the junco below is a male and the junco earlier in this post was a female. nice moon shot, though I don't think I've ever thought of the moon as looking like a banana but perhaps it sort of does. hope you have a lovely winter season. Sweet birds Carver. Loved the moon shot also. December was pretty warm to begin with here in Hong Kong. It's still warm by your standards (no ice or snow!) but we've had a few days of sweater weather finally! 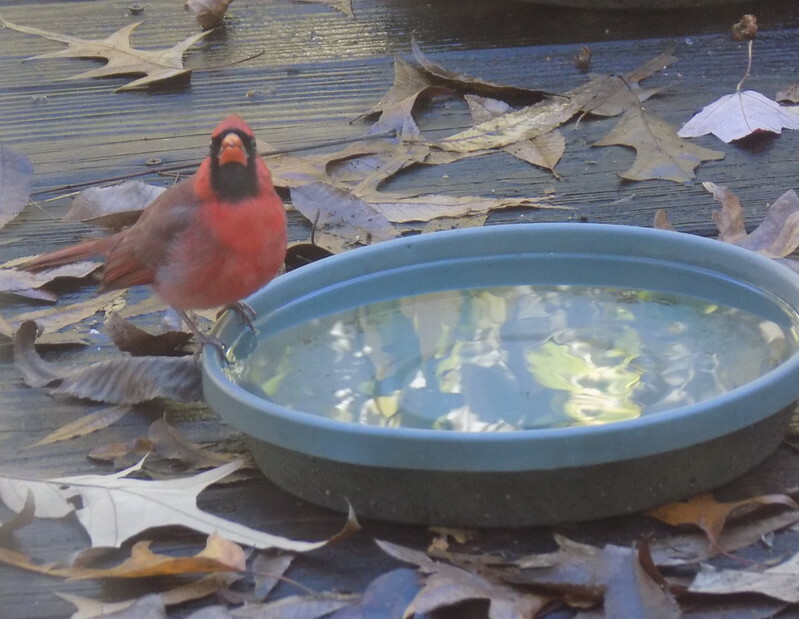 You are so lucky to have birds in your garden, although I put out for for them they don't visit me, I think it is because there are many cats in the area. Lovely moon photo. Love the little bluebird and always your cardinals! Glad that hawk in the later post) was absent on this day! I almost said that the ice reminded me of plastic wrap on the post above ( as I'm scrolling backwards, caching up).